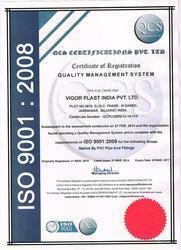 Roots of Vigor Plast India Pvt. Ltd., the client-centric manufacturer and supplier firm of modern day CPVC and UPVC Pipe Fittings are dated back to the year 2012. We are leveraging the strong domain expertise of our R&D specialists to bring forth a wide assortment of next generation products, such as CPVC Pipe Fitting, UPVC Elbow and UPVC Tee. Our line of products shows a testimony of our operational proficiency, which can also be seen in the products characteristics of industry proven designs, strong construction, perfect finish, and superior resistance to corrosion, ease of installation and performance and fitment assurance. We are providing the exacting client requirements for diverse industrial sectors, and our consistent focus to assume the customer demands to gain the ability in producing a well-organized and customer centered approach. The innovative design and exceptional functionality of our products offer 100% endurance ratings that provide to our pursuit of perfection. Further, we continually modernize our infrastructure to add the extent of progressions in our quality endeavors. In addition, our vision of building unmatched value for our esteemed customers furnishes us to give verified quality products within the accepted time frame. Our leader and mentor Mr. Jayesh Patel is the driving force that enables our competitive potentials. He is supported by extensive industrial experience that provides maximum perfection and support to our brand image. To offer excellent and superior products while keeping market trends in mind to gain utmost customer satisfaction & distinguish market position in this field. To be one of the leading company in its field. We have selected industry’s best people that are strengthened with unique prospects and rich skills set. Owing to their ability we have been able to produce groundbreaking success. Our people are the greatest asset to the company, who make certain to encourage collegial work environment to stimulate the scope of reform and success in the business. Furthermore, we accompany regular training and knowledge developing assemblies to support their ingenuity and challenging approach. We are responsible for attending to the long unmet requirements of our valuable patrons, therefore are developing customer-oriented business models to become the companion of choice. Our work set up includes leading techniques and modernized R&D facilities that makes us able to satisfy the obligation of total quality management. Moreover, we believe noble behavior and sustainability are the cornerstones in our market leading position. With a purpose to reach to the thresholds of driving standings, we have received a rigorous quality policy. This indeed makes us capable of showcasing our steadfast focus towards essential levels of client satisfaction. Our defined quality policy stands for determined industrial norms of product manufacturing and distribution. We have chosen highly experienced quality support officers, who make certain that every element is designed and generated with adherence to the highest industrial standards and clients’ prospects.